I wanted to do a very honest review of the popular online store called Boohoo, which is based out of the UK. One of the best things about shopping at Boohoo as a Canadian is that you do NOT get charged customs because the company already pays it. (If you’ve read about any haul on my blog, you know how I always end up paying extra duties and customs) The site also mentions the relatively fast standard delivery, which is supposed to take less than seven business days. I placed an order on Saturday December 15th, and had received it within five business days on Friday the 21st of December. The cost of standard shipping is $11.99 CAD. Express shipping is significantly more expensive, and promises to get you your items within four business days for the cost of $29.99. Boohoo’s Plus and Curve sizes run from a Canadian 10-24, and have a very spot on size chart to help navigate you between items and their fits. I did, however, find that for most of the pieces the sizes ran from a 12-20. Just make sure you are ordering in Canadian sizes and not UK sizes which run about two whole sizes smaller. I ordered a size 18 for all of my items because I do have very wide hips, and according to the sizing chart those would be my best fit. 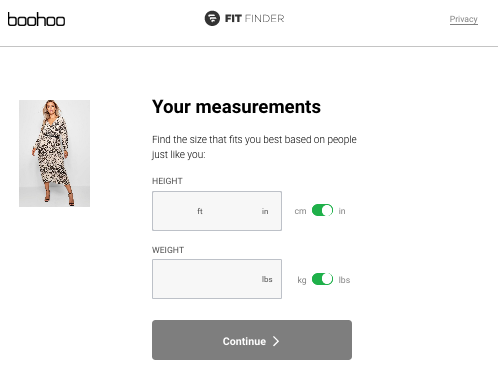 They also do have a size app on their site where you input your weight and height, and they give you a size recommendation. So from what I’ve seen, Boohoo has a permanent 60% off sale going on. The prices that they’re allegedly marking down from, appear to be a tactic to sell and to make you feel like you’re getting a good deal. I think if the items were at the price listed pre-sale, no one would be ordering from them. That being said, for what you get (after the alleged 60% discount) is not bad. For two turtle neck body suits, a pair of jeans, a fur shag coat, and a belt, I paid $148.79, which includes the $11.99 shipping charge for standard delivery. The snakeskin bodysuit came in the expected jersey-knit material. I did find that the torso was a little shorter than what I expected( aka It took a few tries to clip the buttons at the crotch). The material was thin overall, but thick enough to not show your bra. Out of all the items I ordered, these pants were by far my favourite piece (I’m heavily considering buying them in yellow too). The split black pants are made of a stretchy poly-blend material that is thick, and sits quite high at the waist. The fit is slightly larger than I was expecting but I still highly recommend this item. I’ve always wanted to get either a furry coat, or a long teddy one, so I knew I needed to add this one to my cart. The item is pretty true to the picture, however, this item sheds. (My black top and jeans were covered in threads). The fuzzy coat fits well especially around the shoulders, and the sleeve length is long enough to reach my wrists. This is such a great piece for transitional seasons and looks fabulous with any pair of jeans. Nothing makes me happier than finding cute accessory options for my plus size girls. 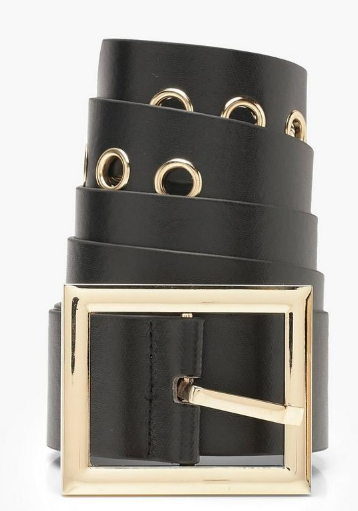 This belt is gorgeous with its gold grommit detailing, and big square buckle. Not the best quality, but is still worth trying out with the price being just over $10. Girlllll….these jeans were tight around my hips. I wish I had complained when I initially realized the wrong size was sent to me, however, since I was heading to Montreal literally hours after getting the package, I decided to take it with me anyways and squeeze myself in, but the entire time I was in them I could NOT bend down, or walk with long strides. Looking back, I don’t think I would have needed the size 18, but a 16 would have been a much better fit. I love that these jeans are more of a boyfriend style, and the placement of the distressing is surprisingly flattering. The material is more of the classic thin-cotton blend that reminded me of a pair of oldschool Levis. Unlike the snakeskin print, the black jersey bodysuit was much thinner in material (something I realized when I looked back at the pictures). I think every woman should own a lightweight, fitted, mockneck top. It’s one of those pieces that dresses up any casual look. I would not recommend this one though. I really liked a lot of the pieces I got from boohoo, and will definitely be ordering from the site again. The pieces are much better quality at boohoo compared to Shein, and will last you more than one wear. The fit was also lot nicer and more consistent than I was expecting. The price is hard to beat since it includes customs and duties for Canadians.